First Friday brought in some rough weather so Jenn let Baxter stay home so he wouldn't get chilly paws. :) Beautiful weather slated for April's event. Come out and say hi. Jenn looks forward to meeting the fans and Baxter loves getting all the pets. He's such a good boy! You asked for it and we listened! The hardback version of "Baxter Goes to Imagination Land is available now only on Amazon.com. Order yours today. Another successful First Friday! Baxter and Jenn upgraded their booth this month. Baxter needed more room ;) Another great crowd and beautiful weather. Every event gets a little bigger. This February 2, Jenn and Baxter invite you to come take a seat and a pic with Baxter on his grassy patch. Don't forget to say hi to Jenn and grab your copy of Baxter's adventure. The first First Friday of the year went off without a hitch. Baxter and Jenn attended and brought some new stickers and coloring sheets to share with eager fans and friends. Come out and say hi at their next event February 2, 2018 on Main St. at First Friday. 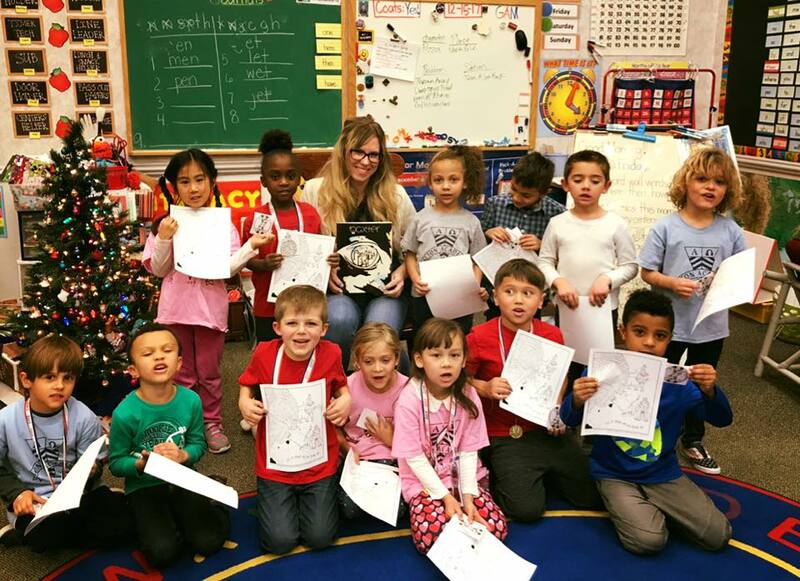 Jennifer Hart visited Ms. Connie's Kindergarten creative writing class at Seton Academy. "Those kids were so smart and imaginative. It always blows my mind how children's brains work. They are so pure and uninhibited at that age. I hope it was as inspiring for them as it was for me." - Jennifer Hart. After a reading of "Baxter Goes to Imagination Land" that had the kids giggling and asking questions the class got a question and answer about being an author with Jenn. Finally, she guided a live brainstorm with the class and they came up with their own story. The class illustrated a cover for the storyline they came up with together. "A pizza that got lost in the North Pole when it fell into a garbage truck and was driven away. After escaping the truck through a perfectly triangle-shaped hole it called a magic jet that flew it home." Hart teases fans with early drawings of her upcoming coloring book starring Baxter The Dog as he returns to Imagination Land to explore and meet more fun characters from this colorful world. Join Baxter's Pack to be notified when the coloring book goes on sale. Jenn and Baxter attended the Fresh 52 Christmas Market and had a fun filled day meeting fans, meeting elves, singing carols and sharing their story. Stop and say hi at upcoming events with First Friday in January, February and March.